Another successful BREEAM project delivered with IKEA, however the new IKEA Greenwich is quite different to anything we’ve seen before. The building has been certified with a BREEAM Outstanding rating, with a final certified score of 90.44% – the highest rating ever achieved for an IKEA store globally, and the second highest scoring retail building ever certified against the BREEAM standard. As BREEAM and sustainability advisors to IKEA, Envision are very proud to have been involved with this fantastic building. IKEA Greenwich is an example of how strong client ambition, close design team working and positive contractor engagement can deliver highly sustainable buildings. The latest edition to IKEA’s portfolio of UK stores is jam-packed with sustainable design concepts, all of which have been developed with careful consideration to the buildings environmental footprint. Solar PV: A 850 kWp solar array supplements the store’s energy requirements and reduces the energy dependence from the grid. Water Efficiency: Two rainwater harvesting tanks alongside low water use fittings reduce the store’s water consumption by up to 50%. Evaporative Cooling Units: Evaporative cooling help reduce energy demand from the stores air conditioning system. Ground Source Heating: Ground source heat pumps provide the store with 88% of the annual heating and cooling demand. Biodiverse Green Roof: A green roof consisting of various substrate and habitat areas provides fantastic new and varied habitat for local wildlife. Sustainable Transport: Various public transport links, cyclist facilities and provision for EV vehicles give IKEA staff and store visitors sustainable transport options when travelling to the store. FSC Certified Timber: The store incorporated 100% FSC in the timber constituents of the build. 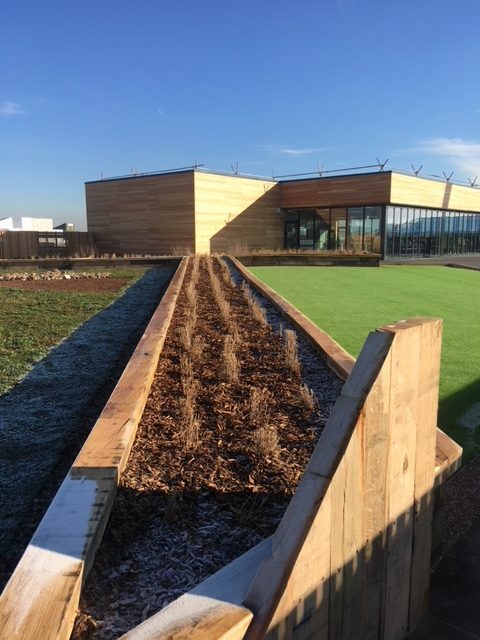 The new store features a Learning Lab – a dedicated space for customers, partners and the local community to explore prolonging the life of products, upcycling, reducing waste and growing their own food. As such, the new store acts both as a test bed for behavioural change and a space to help inspire and enable people to live a more sustainable life at home. Envision has been working with IKEA to deliver BREEAM ratings on new construction and refurbishment projects, including Excellent ratings of Sheffield and Exeter. The Greenwich store sets the bar for sustainability to the highest level. If you require support to deliver exemplar buildings, please contact us at Envision.